If you are a USA print subscriber, the first thing you will notice will be your sample of the brand new Derwent Lightfast colored pencil. If you didn’t get one, there might be a limited amount still available on our website. Also, anyone in the world will have a chance to win one of five sets, visit www.coloredpencilmag.com/lightfast for more info! We appreciate Derwent for letting us be among the first to test it, and for our readers to be among the first to try them. Learn more about them in the Spotlight article! This month, you will learn about botanical drawing from Cheryl Miller who was kind enough to share her vast experience on the subject with us. Next, Barb Sotiropoulos shows us five helpful apps for artists. 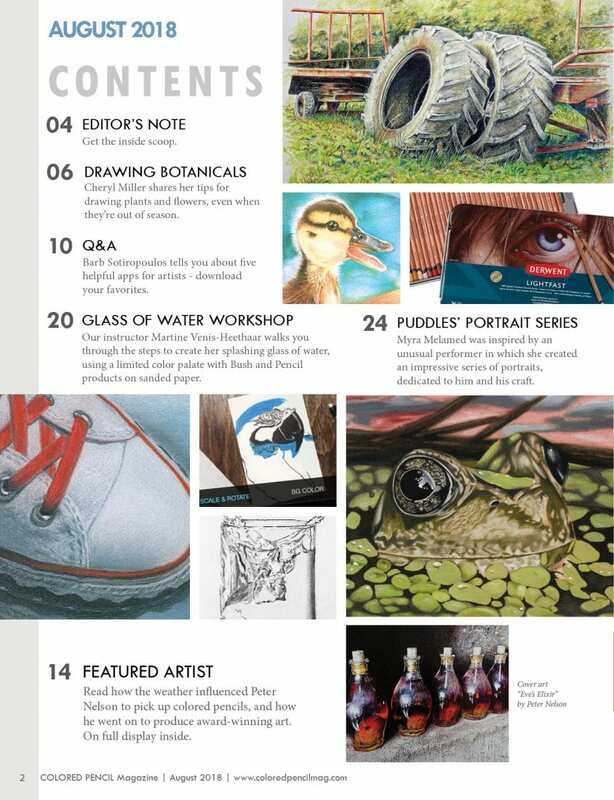 If you’ve wanted to try the Brush and Pencil products, then this months’ “Glass of Water” workshop by Martine Venis-Heethaar is for you. Also, read how Myra Melamed was inspired by an unsuspecting character to create her portrait series. We all have social media pages, like Facebook, so do we really need to go through the trouble of creating a website? I think so, and I will share with you my thoughts and findings on the matter. 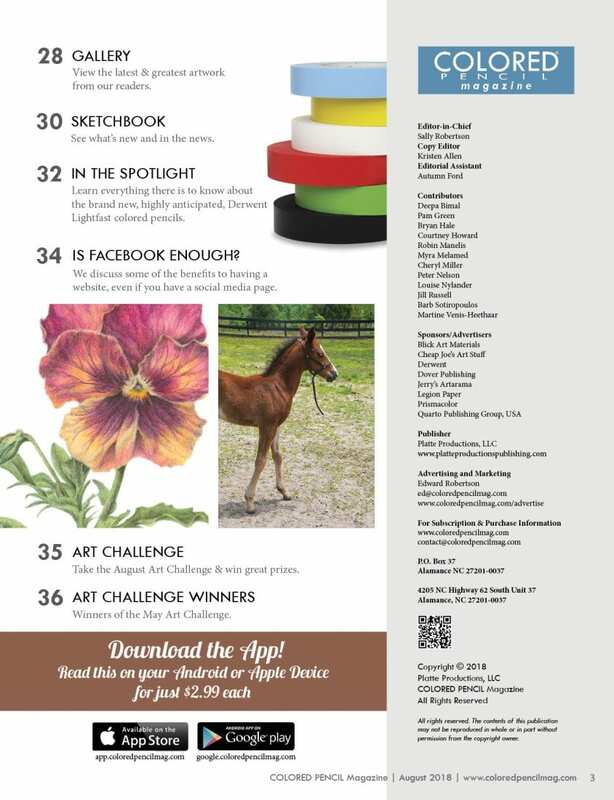 I hope you enjoy this month’s Art Challenge, it is a photo of our horse Royal Kastell – yes, named after the one and only, and he is just too adorable not to have you take a shot at drawing him for some awesome prizes by Jerry’s Artarama to the tune of $300 in eGift certificates! We are thankful to them and to our growing list of supporting companies, who work to keep us up-to-date on products that matter to you! Finally, I am thrilled to introduce Peter Nelson as our August featured artist. Many of you are familiar with his award-winning work, and now you can read how it all got started. LAST CALL! Be sure to enter our 2018 Art Competition for some amazing prizes. Free entry for subscribers. Prismacolor | Quarto Publishing Group USA Inc.